Advanced Workstations in Education, Inc.
Advanced Workstations in Education, Inc. (“AWE” or the “Company”) is a leading provider of digital learning solutions for young children. With approximately 45% market share of the public library market, AWE is the market leader in all-in-one educational computer solutions for early learners. AWE’s digital learning solutions are found in over 8,500 locations worldwide including libraries, public and private schools, childcare centers and homes. AWE’s software is one of the most expansive content portfolios across all subject matters that supports a variety of different learning and teaching styles, all blended into one fully integrated Learning Management System. With a focus on Pre-K through Grade 3 students, AWE’s products have been used by over 5 million children worldwide and it has collected over 170 million hours of learning hours and statistics. The Company embarked on an aggressive multi-year sales initiative to penetrate the K-12 public and private school market. The sales effort failed to meet revenue expectations and resulted in significant cash burn and liquidity constraints. With its equity infusion exhausted and debt capacity exceeded, the Company was forced to file Chapter 11 in November, 2014. The Company retained SSG to explore strategic alternatives immediately before the Chapter 11 filing. SSG conducted a comprehensive marketing process which resulted in a wide range of potential buyers, including multiple strategic and financial parties interested in the Company as a going concern. 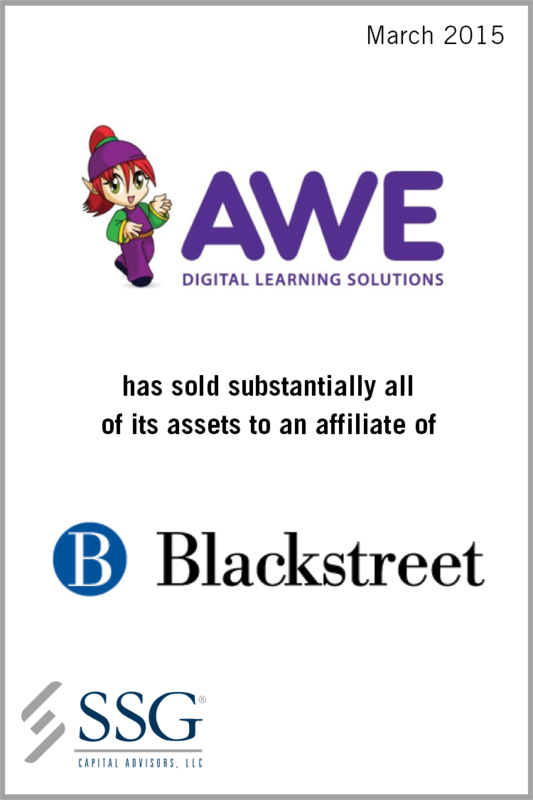 An affiliate of Blackstreet, a lower middle market private equity firm, ultimately acquired AWE’s assets through a Section 363 sale process approved by the U. S. Bankruptcy Court for the Eastern District of Pennsylvania.